I’ve talked before about being Grandma’s girl. I spent so much time with my grandma during the years I was growing up. As an adult, I continued to have a very close relationship with her. I’m so fortunate that she lived close. She lived until she was in her 90s, so my kids were able to know her as well. She was already 60 when I was born since my mom was the baby of the family, but she was in excellent health. I remember us going on long walks every time I spent the night with her. I miss her so much. COCO is all about family and love (and food!). And speaking of love, you’re going to love Pixar COCO! From the moment COCO began until the final scene, I was mesmerized by this colorful, charming, heartwarming, and wonderful film. Miguel is a young boy living in a family of shoemakers. They weren’t always shoemakers, but when Miguel’s great-great grandfather left to make music and never came back, his great-great grandma took matters into her own hands. She banished music from the family and began making shoes. But Miguel loves music. He feels the music, and it is a part of him. That makes him feel torn. He loves his family, but he can’t let go of who he is. Don’t we all feel like that sometimes? Part of what makes us unique can at times alienate us from others…sometimes even family. COCO is a movie that is very much about a family’s love. It is that intense love and need to protect our family members that sometimes complicate things. That’s what happens to Miguel. His family thinks they are protecting him by keeping him away from music. Miguel is forced to take extreme measures, and that gets him in big trouble. It sends him to the Land of the Dead. When Miguel goes to the Land of the Dead, he has the adventure of a lifetime. He learns a lot about family and loyalty. Miguel also learns that things are not always as they seem. Most of all, he learns that no matter what, his family loves him. If you haven’t been to see Pixar COCO yet, you’ve got to go. There’s so much to love! 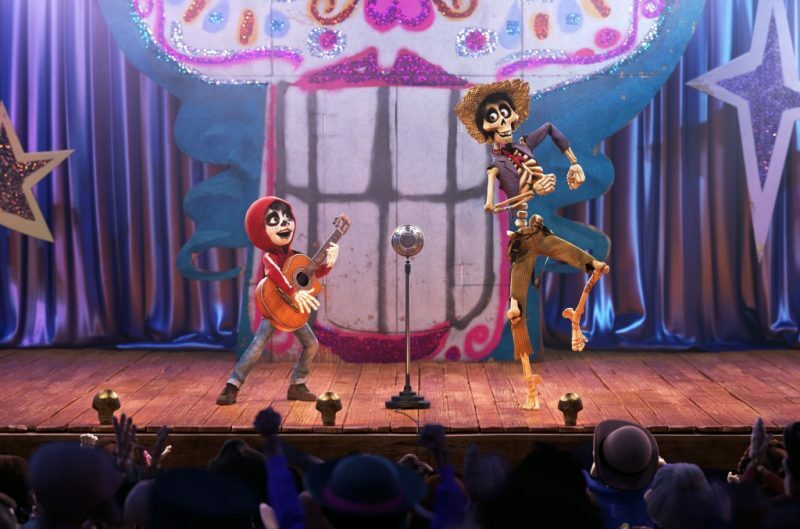 I love the music, the story, the animation, the acting…everything about COCO. Take your tissues because there are some really touching moments. COCO is a movie for everyone. I will say, young children might be afraid of the skeletons and intense moments, so use your best judgement. I remember when I first watched the trailer for COCO. I got tears in my eyes! The part at the office where the clerk finds out about Miguel is so funny, and it’s still one of my favorite scenes. And the music. Music allows our loved ones to live on in our hearts. My son proves this with his love for the guitar. Sure, he played before his dad died, but now he plays songs Kevin played. Kyle has Kevin’s picture on his amp. The love of music lives on and allows him to feel close to his dad even though he is gone. I’ve got some free printables to share with you. Just click the links, and you’ll go to a page where you can print these full-sized. There are games and crafts just for you and your Pixar COCO lover! 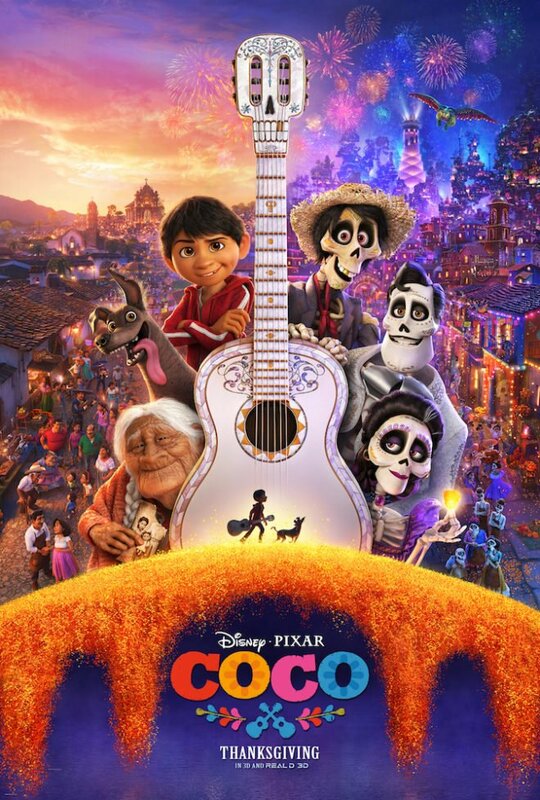 COCO is now playing in theatres everywhere!